The appropriateness of the community management approach to manage rural water systems in a sustainable way is debated. One of its attributes is the strong capacity building focus that it has brought into development work. 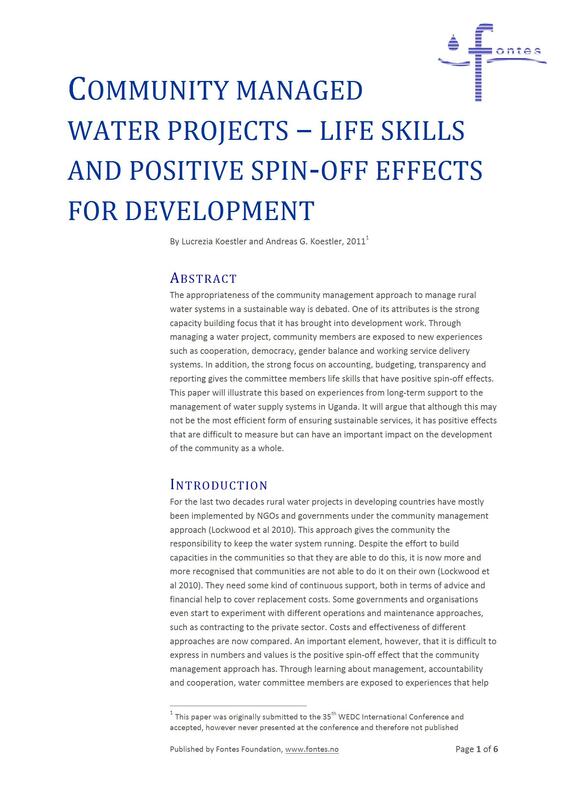 Through managing a water project, community members are exposed to new experiences such as cooperation, democracy, gender balance and working service delivery systems. In addition, the strong focus on accounting, budgeting, transparency and reporting gives the committee members life skills that have positive spin-off effects. This paper will illustrate this based on experiences from long-term support to the management of water supply systems in Uganda. It will argue that although this may not be the most efficient form of ensuring sustainable services, it has positive effects that are difficult to measure but can have an important impact on the development of the community as a whole.